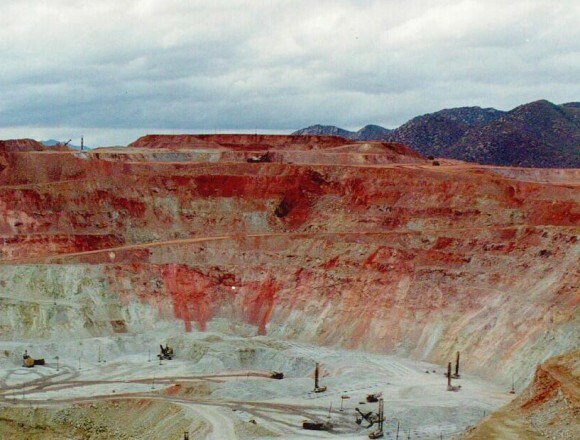 One of the largest open-pit copper mines in the world, the Buenavista del Cobre mine in Cananea produced over 200,000 metric tons of copper in 2012. The mine, opened in 1899, is located approximately 40 kilometers south of the border between Arizona and Sonora, Mexico. The open-pit mine was estimated to contain 26.874 million metric tons of copper reserve as of December 2012. 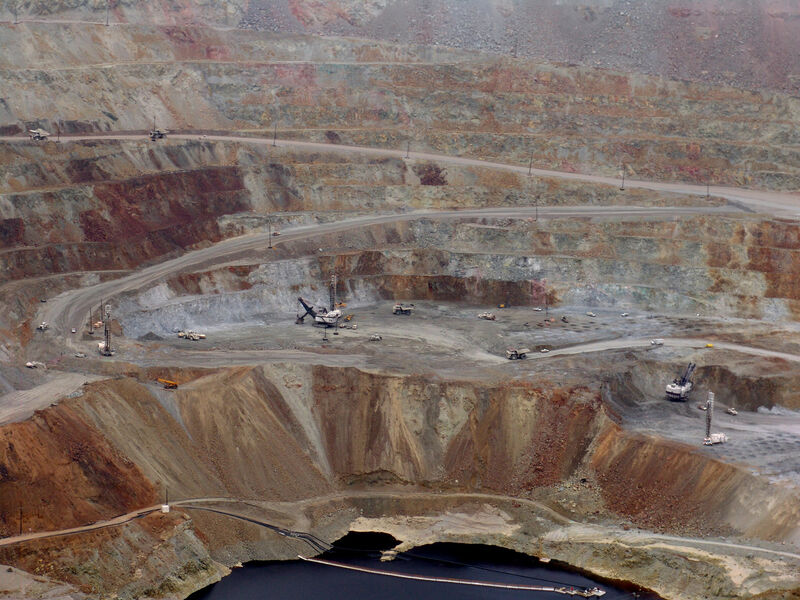 The ore is refined at an on-site concentrator, which has a milling capacity of 77,000 metric tons/day. The concentrate output is transported to the smelter at La Caridad by rail. Also present are an on-site leaching facility and two solvent extraction and electro winning (SX/EW) plants, with an annual production capacity of 55,000 metric tons of copper cathode. The active, 2-kilometer-diameter Colorada Pit (top right of image below) is recognizable in this astronaut photograph by the concentric steps, or benches, cut around its perimeter (see larger image). These benches allow for access into the pit for extraction of ore and waste materials. Water (black) fills the bottom of the pit and several other basins in the surrounding area. 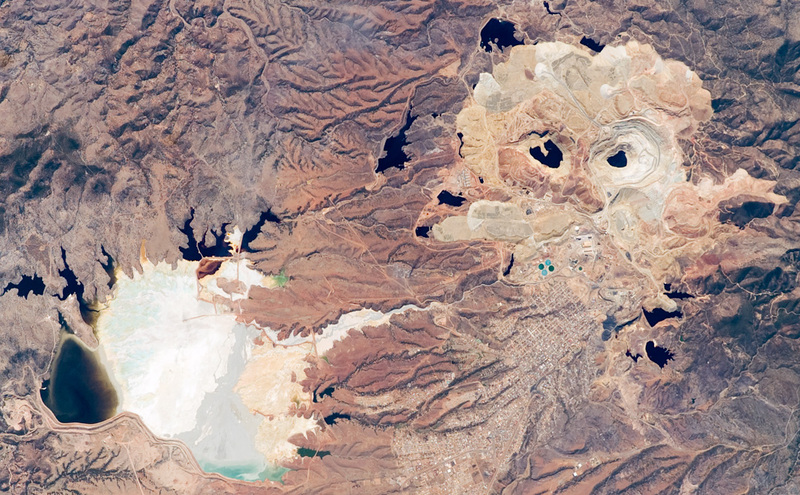 The city of Cananea, marked by its street grid, is northeast of the mine workings. A leachate reservoir for removal and evaporation of water pumped from the mine workings is located to the east of the mine (image lower left). The bluish-white color of deposits near the reservoir suggests the high mineral content of the leachate. Popocatepetl Volcano, near Mexico City continues to be very active, with smoke and ashes belching up to 1000 meters above the crater rim. Mexico’s National Disaster Prevention Agency Cenapred, reports that the volcano had 82 “low intensity” exhalations on 7 August 2014, four of which contained “explosive material”. 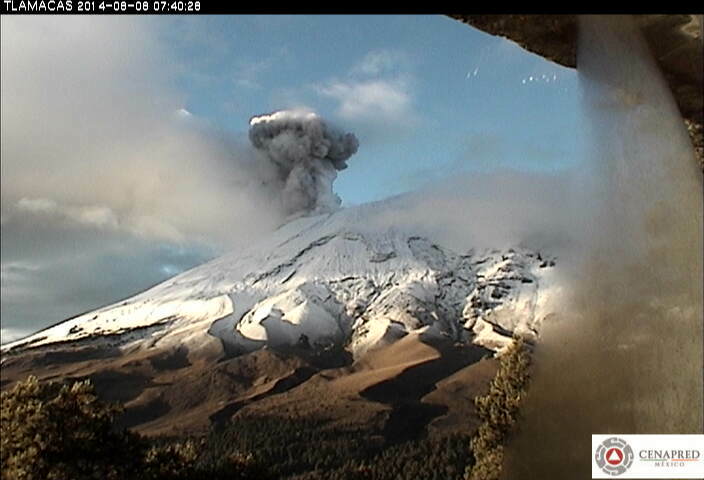 Popocatapetl, 8 August 2014. Credit: Cenapred. The agency also reported that many mionr tremors hd been recorded, including one harmonic tremor lasting 56 minutes. Geologists believe that the volcano is currently destroying dome number 50 even as dome number 51 begins to form. Dome #51 is currently about 70 meters in diameter. Renewed explosions, together with some ash fall is predicted for the coming days. The Volcanic Traffic Light remains at Yellow Phase 2. A short distance west of the crater lake of Santa María del Oro, in the west Mexico state of Nayarit, is Ceboruco volcano which has a cobblestone road to the top. The road starts from the old and picturesque village of Jala, eight kilometers off the main highway (Highway 15). The cornfields around Jala yield some of the largest ears of corn in the world, more than 30 centimeters (one foot) in length, a cause for celebration in the village’s annual August festival. Jala was declared a Magic Town in 2012. The road up Ceboruco is a geologist’s or biologist’s dream come true, a slowly unfolding series of volcanic forms and different types of vegetation with abundant surprises even for the scientifically expert. Small wonder, then, that the great German botanist Karl Theodor Hartweg was so impressed with Ceboruco when he collected plants here in the nineteenth century. To read more about his discoveries, see The geography of garden flowers, many of which originated in Mexico. 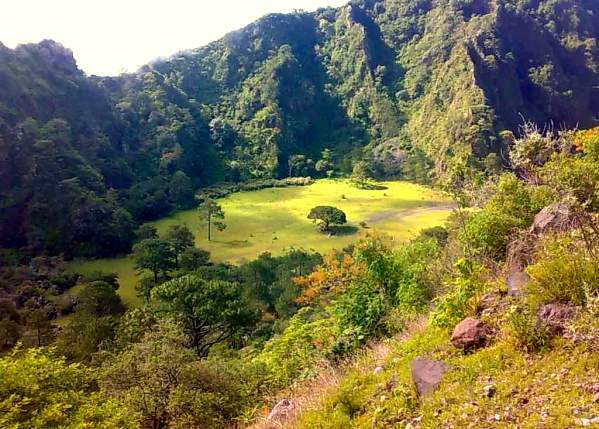 Near the top are several short but interesting walks, some in shady, thickly vegetated valleys hidden between towering walls of blocky lava, some along the many overlapping rims of the various old craters of which this complex peak is comprised. Wherever you choose to walk, a multicolored profusion of flowers and butterflies will greet your eyes. On the south side of an attractive grassy valley at kilometer sixteen, fumaroles send hot gases and steam high into the air reminding us that this volcano is not yet irrevocably extinct. A massive Plinian eruption in about the year 1000 sent ash plumes into the air and devastated a wide area around the volcano. The huge blocks of lava near the summit date from a prolonged series of eruptions in the early 1870s. Highway 15 cuts through Ceboruco’s lava field a few kilometers after the Jala junction. For those not wishing to brave the cobblestone road up to the volcano, this is a good place to stretch the legs and marvel at the inhospitable, black lava blocks which were spewed out more than a hundred years ago. This is a lightly edited extract from my “Western Mexico: A Traveler’s Treasury” (link is to Amazon’s “Look Inside” feature), also available as either a Kindle edition or Kobo ebook. Want to read more about Mexico’s geomorphosites? The link uses Geo-Mexico’s “Site Search” feature. The Sac Actun (“White Cave”) river system in the Yucatán Peninsula wanders for 153 km (95 miles) through a maze of underground limestone caves. It took British diver Stephen Bogaerts and his German colleague Robbie Schmittner four years to explore the caverns using underwater scooters and specially rigged gas cylinders, before they finally discovered a connection between the Yucatán region’s then second- and third-longest cave systems, known respectively as Sac Actun and Nohoch Nah Chich (“Giant Birdcage”). Following the discovery of a link, the entire system is now known as Sac Actun. The system has a total surveyed length (including dry caves) of 319 kilometers (198 mi), making it the longest cave system in Mexico, and the second longest worldwide. [The longest is the dry Mammoth Cave System, Kentucky, USA, which measures 643.7 km (400 mi) in length]. Vying with Sac Actun for the title of longest surveyed underwater cave system is the nearby Sistema Ox Bel Ha (“Three Paths of Water”), also in the Tulum municipality of Quintana Roo. As of August 2013, surveys had measured 256.7 kilometers (159.5 mi) of underwater passages. The underground passages and caverns of the Yucatán Peninsula have been a favored site for cave explorers for decades. Formal mapping of the systems has taken more than 20 years of painstaking work. Access to the systems is via the hundreds of sinkholes (cenotes) that litter the surface of the Peninsula. The Sac Actun system alone includes more than 150 cenotes. Water management was critical to the Maya as they developed their advanced civilization in this area, a region with very limited surface freshwater. Many of the cenotes in the Yucatán Peninsula have archaeological importance and were utilized by the Maya for ceremonies. Perhaps the best-known (and most visited) cenote is the Sacred Cenote (cenote sagrado) at the archaeological site of Chichen Itza. The caverns of the Yucatán Peninsula were formed as a result of the slow solution of limestone over thousands of years by percolating, slightly acidic, rainwater. In some cases, cave formations, such as stalactites and stalagmites, have later grown in the caves, formed drip-by-drip from the slow deposition of calcium carbonate from calcium-saturated ground water. Because the average elevation of the Yucatán Peninsula is only a few meters above sea level, the water in many of the caves is “layered”, with a lens of freshwater overlying a layer of salt water. Rainwater that soaks into the ground becomes ground water, which then moves slowly along the watertable to eventually reach the ocean. Cave researchers are worried that tourist developments in the Yucatán Peninsula will have adverse impacts on underground water systems, both in terms of water quantity (because of the amounts of fresh water extracted for domestic and tourist use) and in terms of water quality, because even point sources of water pollution (such as excess fertilizers from a golf course) could contaminate underground water supplies over a wide area. The breathtaking scenery of the El Pinacate and Gran Desierto de Altar Biosphere Reserve in the northern state of Sonora affords visitors a dramatic combination of two very distinct landscape types: volcanic landscapes (El Pinacate) in the east, and sand dunes (Gran Desierto de Altar) towards the west and south. The eastern section of the Biosphere Reserve, El Pinacate, is a dormant volcanic area of around 200,000 ha (2000 sq. 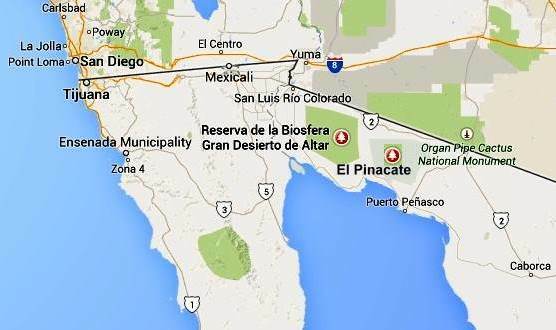 km), centered on the El Pinacate Shield (or Sierra Pinacate) which has 3 main peaks: Pinacate, Carnegie and Medio. The El Pinacate Shield is a composite structure, comprised of extensive, successive black and red lava flows, some more than 20 km long, seperated by desert pavement. 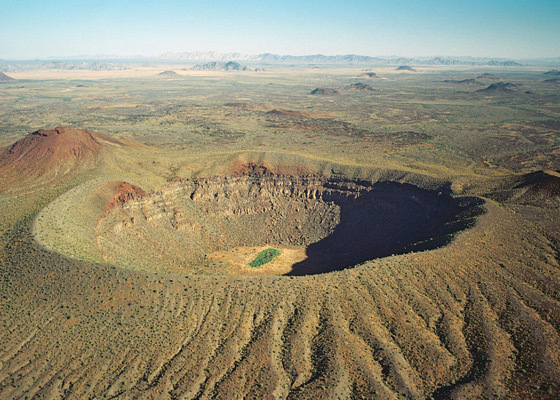 The El Pinacate Shield boasts a wide array of volcanic phenomena and geological formations. Most of the lava is basaltic (alkaline) in composition, making it relatively fluid when molten; it is mainly of the aa (blocky) type, though some pahoehoe (ropy) lava is also found. The total volume of lava is estimated at between 150 and 180 km3. Besides the lave flows, the Pinacate area has more than 400 cinder cones (formed 1.2 million years ago) and several lava tubes. The lava flows and cinder cones are only a prelude to the most visually striking features in the reserve: 10 enormous, deep, and almost perfectly circular maars (steam explosion craters). Maars are believed to originate from a combination of explosion caused by groundwater coming into contact with hot lava or magma and subsequent collapse. The maars of El Pinacate are rivalled only by similar formations in Africa. The largest single maar is El Elegante, formed 32,000 years ago, which is 1,400 meters (4,600 feet) from rim to rim and 140 meters (460 feet) deep. It takes visitors a two to three-hour hike to reach its rim and be rewarded by a spectacular view. The volcanic forms of El Pinacate are relatively recent in geological terms, most having been formed during the Quaternary Period, which began some 2.8 million years ago. The most recent volcanic activity in this area was only about 11,000 years ago. Some volcanologists believe that some of these craters could become active again in the future, with the potential to form volcanoes up to a few hundred meters in height. Ron Mader, the founder of Planeta.com and a foremost authority on responsible tourism in Mexico, has marveled at the “bizarre and mind-boggling scenery” of El Pinacate., which so resemble the lunar landscape that between 1865 and 1970 it was used by NASA as a training ground for astronauts preparing for the moon landings. The lava field is so vast and sharply defined that it later turned out that the astronauts could easily recognize it from space! The western and southern parts of the El Pinacate and Gran Desierto de Altar Biosphere Reserve have entirely different scenery. The Gran Desierto de Altar is North America’s largest field of active sand dunes (erg). Several types of dunes are represented here, the tallest reaching 200 meters in height. The sand needed to form and maintain these dunes comes from the fluvial and deltaic sediments of the Colorado River delta (to the west), the beaches of the Sea of Cortés/Gulf of California (to the south), the River Sonoyta (to the east) and the smaller river and stream fans formed in those parts of the reserve where there are volcanic and granitic mountains. Prior to the opening of the Sea of Cortés (Gulf of California), vast amounts of sediment accumulated in this region brought by rivers of which little trace remains today. The creation of the Sea of Cortés, 5.3 million years ago, shortened the rivers and increased their average gradient (rejuvenation), causing them to cut into the pre-existing landscape leaving behind river terraces, remnants of the former higher level floodplains. The fields of sand dunes of the Gran Desierto de Altar cover more than 550,000 hectares (5700 sq.km.) 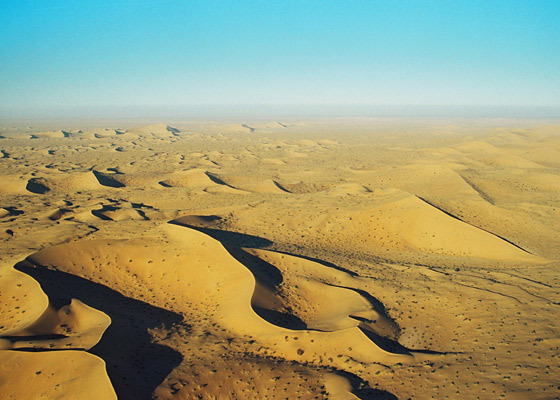 Several different kinds of sand dunes are found here–linear, crescent-shaped (barchans) and star-shaped–and they can be simple, compound or complex, depending on seasonal changes in the direction and strength of the wind. Although linear dunes dominate (70%), crescent-shaped complex dunes and star-shaped dunes are of more interest because they exist in only a few locations in the world. Spectacular and very large star-shaped dunes, up to 200 meters high, occur both singly and in long ridges up to 48km in length. Star-shaped dunes possibly evolved from crescent dunes which changed their direction of movement becoming “reversing dunes”. Side winds may account for the multiple arms of some star-shaped dunes. In addition, there are several granite massifs (inselbergs), such as the Sierra del Rosario, emerging like islands from the sandy desert flats and dunes. They range in elevation from 300 to 650 meters above sea level. They represent another remarkable landscape feature harboring distinct plant and wildlife communities. Will the mighty Colorado River ever reach its delta? How ecological is ecotourism in Mexico? 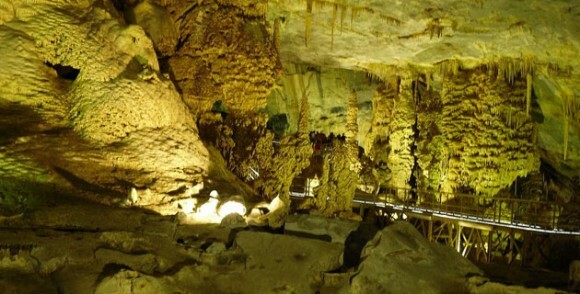 The Garcia Caves (Grutas de García) are located in the Cumbres de Monterrey National Park, 9 km from the small town of Villa de García, and about 30 km from the city of Monterrey (state capital of Nuevo León). The highest point in the park is Copete de las Águilas which rises to 2260 m (7,410 ft) above sea level, but its best known peak is Saddle Hill (Cerro de la Silla), the distinctive saddle-shaped hill that overlooks the city. Much of the park, including the mountains, are composed of sedimentary rocks that were originally laid down as marine sediments and then subsequently folded, uplifted and exposed to erosion. The extensive areas of limestone in the park, which date from the Cretaceous period, have been subject to karstification over 50 to 60 million years, which has resulted in typical karst landforms such as sinkholes, caves, cave formations and underground streams. The Garcia Caves, one of the largest cave systems in Mexico, are deep inside the imposing Cerro del Fraile, a mountain whose summit rises to an elevation of 1080 meters above sea level, more than 700 meters above the main access road. The entrance to the caves is usually accessed via a short ride on a 625-meter cable car that was built to replace a funicular railway. The cave system was first reported in 1843 by the Marmolejo family who informed their local prist Juan Antonio Sobrevilla that they had stumbled across it while looking for firewood. Guided tours of the cave system show visitors some of its 27 separate chambers along a 2.5-kilometer (1.6 mile) route. The full system extends more than a kilometer further into the mountain reaching depths of more than 100 meters (340 feet) beneath the surface. The limestone of the cave walls contains lots of marine fossils. The caves have extensive and impressive formations of dripstone, including stalactities, stalagmites and other forms. Unlike the suffocating heat of the Naica Crystal Caves in Chihuahua, the cave temperature here remains about 18̊C (65̊F) all year. “El salón de la luz” (The Light Chamber) where the natural translucence of the ceiling rock allows light from the outside to filter through. “El mirador de la mano”, a stalagmite shaped like a human hand. “El Árbol de Navidad” (The Christmas Tree). Want to read more about caves in Mexico? Visit John Pint’s website for a selection of his writing, with many original articles, illustrated with great photographs, about many individual caves in Mexico. There is still lots of work needed to fully unravel the geological secrets of Mexico’s Volcanic Axis which crosses the country between latitudes 19̊ and 21̊ North. Unlike most volcanic belts elsewhere in the world, this one does not appear at first sight to correspond to any plate boundary. Another of the mysteries of this volcanic region, where igneous upheavals have shaped the landscape for several million years, is the relative dearth of calderas, the “super craters” formed either by collapse or by giant explosions. While the toponym La Caldera is used fairly commonly in Mexico’s volcanic regions for a volcano or volcanic crater, geologists restrict the term to the much larger landform that results from the collapse or super-explosion of a volcano. Even so, there is still some debate among specialists as to the precise definition of the term caldera. Geologists have proposed a threefold division of the Volcanic Axis, based on differences in the volcanic landforms, in terms of their type, structure, age, morphology and chemistry. The western sector (see map below) extends from the western coast of Mexico to Lake Chapala (including the lake basin). The central sector covers the area between Lake Chapala and the twin volcanoes of Popocatepetl and Ixtaccihuatl, close to Mexico City. The eastern sector includes these twin volcanoes and extends as far as Mexico’s Gulf Coast. Mexico’s Volcanic Axis (Fig 2.2 of Geo-Mexico, the geography and dynamics of modern Mexico). All rights reserved. The precise origin of the Los Azufres caldera, in Michoacán, is still debated. The caldera is the site of an important geothermal power station with an installed capacity of 188 MW. (Mexico is the world’s fourth largest producer of geothermal energy, after USA, the Philippines and Indonesia.) The geothermal heat in this area is also used to heat the cabins in a local campground, and to dry wood and process fruit. The Amealco caldera is in the central part of the Mexican Volcanic Axis, midway between the towns of San Juan del Río and Maravatio. It dates from Pliocene times and has been heavily eroded since. It is about 11 km wide and 400 m deep and was the origin of great sheets of pyroclastic flow deposits (ignimbrites) with a total volume of around 500 cubic km. Mazahua is a collapse caldera, 8 km in width, near the village of San Felipe del Progreso in the western part of the State of Mexico. The Donguinyó-Huichapan caldera complex is 10 km in diameter and in the central sector of the Volcanic Axis. It appears to be two overlapping calderas, dating from around 5 million and 4.2 million years ago respectively. The rocks from the older caldera are intermediate to basic in composition, while those from the more recent caldera are acidic (high silica) rhyolites. The Los Humeros caldera is in the state of Puebla, close to its border with Veracruz. It is 55 km west-north-west of the city of Xalapa (Veracruz), relatively close to Teziutlán (Puebla). The main caldera (summit elevation 3150 m) is about 400 m deep and roughly oval in shape, with a diameter which varies from 15 to 21 km. It was formed about 460,000 years ago by the collapse of the underground magma chamber. Prior to collapse, lava emitted from this vent had covered 3500 square km with ignimbrite. Later, two smaller calderas formed nearby, with ages of about 100,000 years (Los Potreros caldera) and 30,000 years (El Xalapazco) respectively. Volcanic activity in this area has been utilized to produce generate geothermal power (installed capacity: 40 megawatts). The easternmost caldera in Mexico is Las Cumbres, 15 km north of Pico de Orizaba, Mexico’s highest volcano, and close to the state boundary between Puebla and Veracruz. The Las Cumbres caldera was originally believed to be an explosion super-crater, but geologists now think that it was created due to the partial collapse of the eastern flank of the original volcano, between 40,000 and 350,000 years ago. 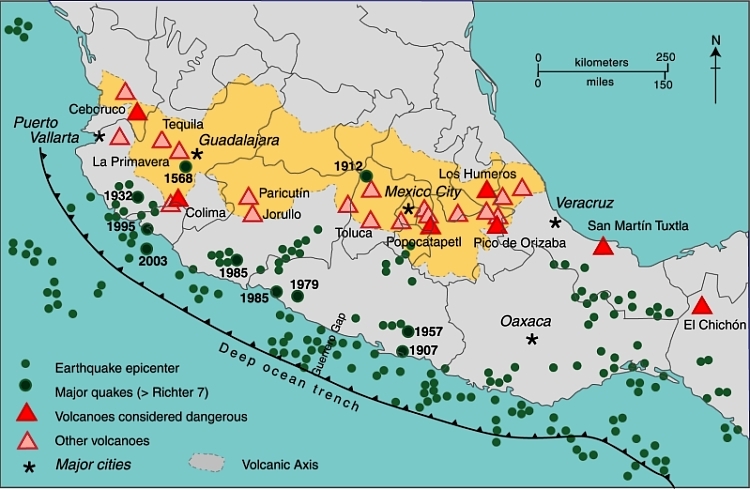 The collapse of the side of Las Cumbres produced a huge debris avalanche (total volume estimated at 80 cubic km, which extended up to 120 km in the direction of the Gulf of Mexico. According to Dra. Esperanza Yarza de la Torre in Volcanes de México (UNAM; 1984), Lake Alchichica in the Oriental Basin near Puebla occupies another caldera. The basin has several shallow lakes, known locally as axalpazcos (“sandy basin with water” in the indigenous Nahuatl language). These occupy shallow craters (or in one case a caldera) and are largely sustained by ground water. The largest of the lakes, in a caldera, is Lake Alchichica, which has a diameter of 1888 meters, an area of 1.81 square km, and lies at an elevation of 2320 meters above sea level. The rim of the caldera rises 100 m above the lake level. The lake is used for irrigation. This lake is claimed to be Mexico’s deepest natural lake with a maximum depth of 64 meters, and a mean depth of 38.6 meters. Gerardo J. Aguirre-Díaz & Fred W. McDowell. 1999. Volcanic evolution of the Amealco caldera, central Mexico. United States Geological Society. Special Paper 334. Esperanza Yarza de la Torre. 1984. Volcanes de México. UNAM. Use the site’s tag system (left hand side of the page) to find lots more posts about Mexico’s volcanoes, geology and landforms. Only days after we published our third post about the Primavera Forest, near Guadalajara, we were alerted to an excellent 9 minute video animation of how the area was formed. This short video about “The Exciting Geology of Bosque La Primavera” was produced by geologist Barbara Dye during her stint as a Peace Corps volunteer in Mexico. How was the Primavera Forest caldera in Jalisco formed? What are the 10 main pressures threatening the Primavera Forest in Jalisco? Other Comments Off on How was the Primavera Forest caldera in Jalisco formed? In this post, we take a closer look at how this unusual area was formed. 140,000 BP. 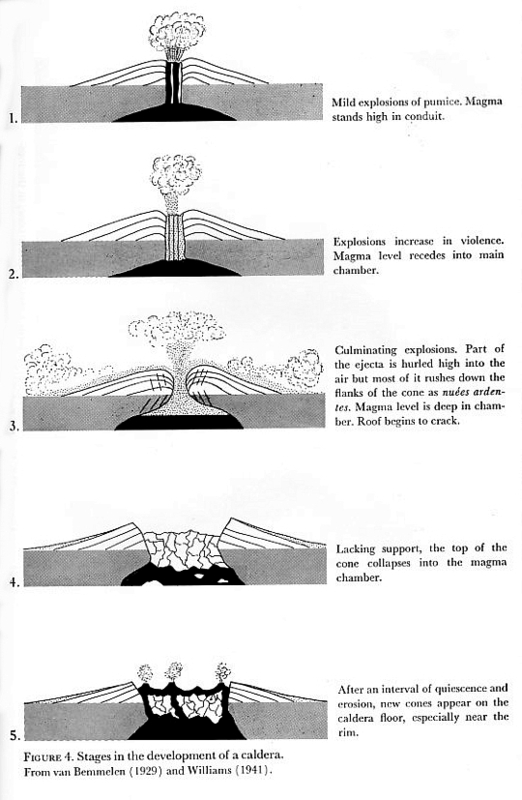 The magma chamber beneath the surface began to fill with magma (molten rock underground) and grow in size. By about 120,000 BP, several lava flows and domes had formed, made primarily of rhyolite, a silica-rich (“acid”) igneous rock. After each eruption, the magma level underground would subside for a period of time before pressure built up again towards the next eruption. So much pressure had built up by about 95,000 BP that there was a huge explosion, sending 20 cubic kilometers (4.8 cubic miles) of rock and ashes high into the sky. The explosion covered 700 square kilometers (270 square miles) with volcanic materials, known today as the Tala tuff (tuff is the geological term for consolidated ash). This massive explosion caused the upper part of the magma chamber to collapse, leaving a caldera that was 11 kilometers (6.8 miles) wide. The Tala tuff includes large quantities of pumice, a light and porous volcanic rock formed when a gas-rich froth of glassy lava solidifies rapidly. This caldera filled with water, creating a lake. This stage began shortly afterwards when a series of ring domes were erupted around the edge of the caldera as the magma deep below the surface started to push upwards again, eventually forming small islands in the lake. These eruptions formed more pumice, blocks of which would break off and start to float across the lake as they gradually sank to the lake floor. A further series of eruptions in about 75,000 BP led to a second series of ring domes. A combination of tectonic uplift and sedimentation had filled the lake in by about this time. More volcanic domes have been created at approximately 30,000 year intervals since, in about 60,000 BP and about 30,000 BP; these domes were almost all on the southern and eastern margins of the caldera, and include the lava domes of El Colli and El Tajo on the outskirts of Guadalajara. Many geologists appear quietly confident that lava and ash eruptions in La Primavera are a thing of the past. They consider that the Primavera Forest’s fumaroles, hot river and hot waterfall represent the last vestiges of vulcanism and are no cause for alarm. On the other hand, others, including Gail Mahood who has studied this area far more than most, warn that hazard monitoring is justified in the case of La Primavera given its proximity to a major city and bearing in mind that any future eruption would be likely to occur on the southern and/or eastern side of the caldera. The La Primavera Forest is only one of several calderas in Mexico’s Volcanic Axis. If you prefer a short 9 minute video animation of how the area was formed, try this excellent YouTube video: “The Exciting Geology of Bosque La Primavera“, produced by geologist Barbara Dye during her stint as a Peace Corps volunteer in Mexico. Mahood G. A. 1980. Geological evolution of a Pleistocene rhyolitic center – Sierra La Primavera, Jalisco, Mexico. Journal of Volcanology and Geothermal Research, 8: 199-230. Mahood, G.A. 1981. A summary of the geology and petrology of the Sierra La Primavera, Jalisco, Mexico. Journal of Geophysical Research, Volume 86. Dye, Barbara. 2013. “La Apasionante Geología del Área de Protección de Flora y Fauna La Primavera”. How has the movement of tectonic plates affected Mexico? El Sótano de las Golondrinas, in the municipality of Aquismón in the state of San Luis Potosí, is a massive limestone sinkhole (pit cave), one of the largest known in the world. In terms of depth, it is thought to be the second deepest sinkhole in Mexico and is probably in the world’s top 20. The depth of sinkholes can be difficult to determine. For example, in the case of El Sótano de las Golondrinas, its surface opening is about 50 meters by 60 meters (160 by 200 ft) in size, but is on a slope. The depth on the high side is about 376 meters (1220 ft); the depth on the low side is about 330 meters (1090 ft). Below the surface (see profile) the sinkhole is roughly bottle-shaped. The floor of the sinkhole is about 300 x 135 meters (990 by 440 ft) in area. However, the sinkhole is believed to have formed from the collapse of the roof of an underground cave. As a result, the floor of the sinkhole is not solid rock but rubble that presumably came from the walls and former roof. A shaft on one side extends down at least another 100 m, suggesting that the true floor of the original cave lies at least that far beneath the current rubble-strewn floor. US photographer Amy Hinkle shot some spectacular images earlier this year in this cave. The accompanying article highlights the “secret garden” that “nestles 300 meters beneath the surface of the earth”. The cave’s name (literally “basement of the swallows”) derives from the thousands of white-collared swifts that inhabit the overhanging walls of its interior. They spiral out of the cave every morning over a period of 25-30 minutes and return to their cave homes close to sunset. Large numbers of green parakeets also live in the cave. The floor of the sinkhole is home to a rich plant life, as well as a diverse selection of fungi, millipedes, insects, snakes, and scorpions. The original cave is thought to have been formed by a lengthy period of water erosion along a major fault line in the lower Cretaceous limestone in the Sierra Huasteca (part of Mexico’s Eastern Sierra Madre). Over time, the cave became larger as a consequence of both the water erosion and due to mass movements (landslides, rockfalls) on its walls. Eventually, the size of the cave was so large that its walls could no longer support its roof which then collapsed into the cave, leaving the open air sinkhole seen today. Following heavy rain, short-lived waterfalls cascade down the sides of the sinkhole. The first documented exploration of El Sótano de las Golondrinas was apparently in 1966. Since that time, the cave has become a popular destination for various adventure sports including rappelling, abseiling and base jumping (no longer allowed). 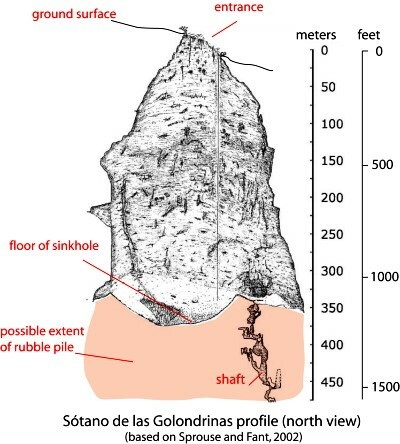 There are several other very deep sinkholes in the same general area, including Hoya de las Guasguas (with a 202 m deep entrance shaft) and Sótano del Barro (402 m in depth). Some ornithological studies have found that the bird population of El Sótano de las Golondrinas is decreasing, perhaps due to the disturbance caused by the increasing number of human visitors. To limit disturbance, access and activities are more tightly controlled. For instance, descents into the cave are now strictly limited to daylight hours when the birds are absent, and a no-fly zone has been established around the cave, primarily to avoid helicopter disturbance. Sprouse, P and Fant, J, 2002. Caves of the Golondrinas area. Association for Mexican Cave Studies Bulletin, 10, 74pp. Irma Brígida Suarez Rodríguez, Alejandro Gutiérrez Hernández & Alma Rafaela Bojorquez Vargas. Sótano de las golondrinas…Maravilla natural de México, acciones para su conservación como destino de turismo de naturaleza.